Pressure, wind speed, and relative distance from NYC, from nhc. Figure 7a. 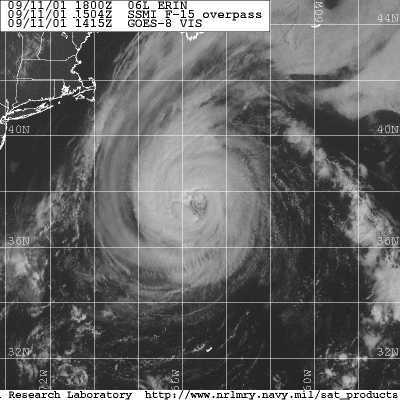 Hurricane Erin, September 11, 2001, at about 37.4°N, 65.6°W, which corresponds to abut 10:15AM (EDT). Figure 6. Sign convensions for wind direction in the above graphs. These sign convensions for wind direction provide numerical values that are shown in the graphs.